At T. J. Copping Ltd, we specialise in Flat roofing, particularly the more traditional three layer system. Flat roofing is still a very popular method of roofing, particularly in London as so many properties have been extended to incorporate extra living or even work space. T. J. Copping Ltd Roofing Specialists also use high performance torches on roofing felts rather than the old hot pot, pour and roll system that was used for many years. By utilysing this system, we can deliver a superior and longer lasting finish to our customers roofs. T. J. Copping Ltd Roofing Specialists also carry out single ply EPDM flat roofing. We cover anything from a small bay to a flat garage roof to much larger projects such as schools or large extension roofs. In fact, there is no job too big for T. J. Copping Ltd Roofing Specialists to tackle. We really are a one stop shop for all your roofing needs. Sometimes we have heard negative comments about flat roofs and that a flat roof is far better being made into a pitched one, we certainly don't dislike pitched roofs, but there is nothing wrong with a flat roof in the right environment. For example, if the the roof in question is an unseen flat roof, what would be the point in spending considerably more money than you need to in replacing a flat roof with a pitched one? We will be more than happy to build you a pitched roof should you desire one, but we feel it's important to offer our clients the most cost effective solution to their roofing needs, we're not just out to squeeze as much money out of our customers as we can, our good name and reputation are far too important to us to do that! By sticking to an ethical and fair set of business protocols, our customers get the beast deal, which make them happy, they then let others know and we receive referrals which makes us happy. As stated above, a pitched roof can cost considerably more than a flat roof and if it isn't going to be seen, why would you want to pay all that extra cash for a pitched roof? A flat roof that has been installed correctly by a professional roofing company such as us, will have an average lifespan of twenty to thirty years and when you consider how often the roof would require changing, it's clear to see why the cost of a pitched roof replacement is unnecessary. The old pour and roll systems had quite a bad reputation and people often confuse the torch method with this. In truth, the flexibility and durability of a modern hot flame applied torch on roofing felt no longer have the drawbacks that were encountered with the flat roofs of yesteryear. 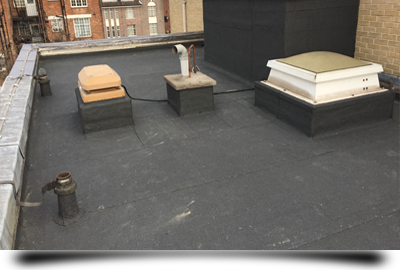 T. J. Copping Ltd Roofing Specialists apply these flat roofs in what is referred to as the 'three layer system' consisting of a vapour control layer, a layer of 2mm reinforced felt and a 4mm layer of other felt which is referred to as a cap sheet. These cap sheets can be of a plain black bitumen finish for a solar reflective paint finish, or a mineral fleck finish in a variety of interesting and pleasing colours. The most typical colours are green, brown and an attractive purple or blue. So how are torch on felt flat roofs contructed? Three separate layers of top quality felt are melt welded together with a large blowlamp or torch. Before you run for the hills, fearing that your house will burst into flames, we would like to stress that T. J. Copping Ltd carry the requisite level of insurance to work with hot flame and we would always discourage homeowners from attempting to use this method of installing a flat roof on a DIY basis for obvious safety reasons. The EPDM rubber roofing system has become very popular since its introduction into the United Kingdom some years ago. A rubber roof can often be installed in one complete layer without the need for any unsightly joins. Clearly this will depend on the size of the flat roof in question. An EPDM rubber roofing system is also extremely light weight, elastic and very durable, the benefits of an elastic material used on a roof has obvious advantages when you consider contraction and expansion depending on the temperature the various seasons will through at a roof. The majority of the rubber roofs we install are glued onto a wooden base so if you had a felt roof previously fitted, the timber deck may require replacement depending on the system or glue that is used. Other fixing methods are possible, the roof may be mechanically fixed, and ballasted, which means it is weighted down with stones. A professionally installed rubber roof can be a very long lasting and attractive flat roofing option.